Most of us tend to approach the Bible early on in our Christian lives as a vast, cavernous, and largely impenetrable book. We read the text piecemeal, finding golden nuggets of inspiration here and there, but remain unable to plug any given text meaningfully into the overarching storyline. Yet one of the great advances in evangelical biblical scholarship over the past few generations has been the recovery of biblical theology--that is, a renewed appreciation for the Bible as a theologically unified, historically rooted, progressively unfolding, and ultimately Christ-centered narrative of God’s covenantal work in our world to redeem sinful humanity. This renaissance of biblical theology is a blessing, yet little of it has been made available to the general Christian population. For that reason I've teamed up with my friend Dr. Miles Van Pelt, who teaches Old Testament at RTS, to work with a series of world-class authors to begin to fill this gap. I am super excited about a series of books we are in the early stages of executing called Short Studies in Biblical Theology. The purpose of Short Studies in Biblical Theology is to connect the resurgence of biblical theology at the academic level with everyday believers. Each volume is written by a capable scholar or churchman who is self-consciously writing in such a way that requires no prerequisite theological training of the reader. Instead, any thoughtful Christian disciple can track with and benefit from these books. It is exhilarating to begin to see how the whole Bible fits beautifully together. It certainly has been for me. Each volume in this series takes a whole-Bible theme and traces it through Scripture. In this way readers not only learn about a given theme, but also are given a model for how to read the Bible as a coherent whole. We are launching this series because we love the Bible, we love the church, and we long for the renewal of biblical theology among scholars to enliven the hearts and minds of Christ’s disciples all around the world. As editors, we have found few discoveries more thrilling in life than that of seeing the whole Bible as a unified story of God’s gracious acts of redemption, and indeed of seeing the whole Bible as ultimately about Jesus--as he himself testified (Luke 24:27; John 5:39). The ultimate goal of Short Studies in Biblical Theology is to magnify the Savior and to build up his church: magnifying the Savior through showing how the whole Bible points to him and his gracious rescue of helpless sinners, and building up the church by strengthening believers in their grasp of these life-giving truths. 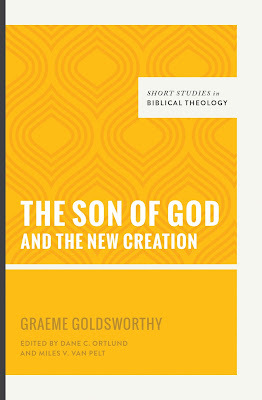 The first volume, by Graeme Goldsworthy, has just released. He traces the theme "Son of God" through the Bible. What a delight to launch the series with a man who is as much a father of the modern evangelical biblical theology resurgence as anyone alive today. My dad is writing the second volume, on marriage. He just sent in the manuscript and it is going to be a stellar contribution. Other volumes under contract are Tom Schreiner on covenant and Jim Hamilton on work. The concern to Vos in his own day is still all too prevalent in the church today. A wide-spread tendency continues to treat the Bible, in practice at least, as if it has been dropped straight down from heaven into the hands of the individual believer, a tendency that in significant ways inhibits the life and hampers the mission of the church. This series of Short Studies in Biblical Theology holds important promise of helping to remedy this situation with its goal of providing pastors and their congregations with studies of key biblical themes that will foster a growing understanding and appreciation of the redemptive-historical flow and Christ-centered focus of Scripture as a whole. I look forward with anticipation to the appearance of these volumes.